The Journal of Psychiatric Intensive Care is devoted to issues affecting the care and treatment of people with mental disorders who manifest severely disturbed functioning. The journal is international and multidisciplinary. 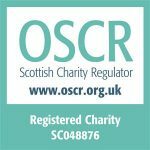 It provides stimulating papers and articles of interest to those who work in or study psychiatric intensive care, low secure services, acute inpatient wards, challenging behaviour environments, emergency psychiatry, or intensive treatments settings in other parts of the wider mental health system. The Journal of Psychiatric Intensive Care encourages informed debate and exchange of opinion. Its content includes editorials, original research, brief reports, reviews, conference reports, news and notices, but preference is given to original research of a high scientific quality. Submission deadlines, for March by the end of January and for the September issue by the end of June. Rates: Advertising in the journal can be booked either as a web based advert or both web based combined with printed advert in the journal. 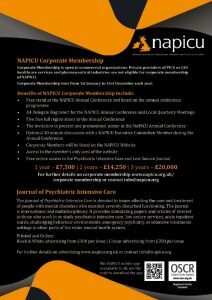 Term: Each advert will remain on the NAPICU Website for a period of 6 months from the date the advert is published. Space may be bought in the print edition of the journal for one issue or two consecutive issues.